Does it mean blogging has taken over your life when you ask the lady behind the fish counter for 8 prawns and "could you choose the prettiest ones with nice eyes please?" So here is my risotto entry for Hay Hay Its Donna Day hosted by Cenzina at il cavoletto di bruxelles. I made one or two tiny alterations to the original recipe. I made a chicken stock to which I added 1 star anise and a small knob of ginger to the water as I wanted to create an Asian influenced risotto. I replaced the wine with Stones green ginger wine, the lemon with lime, omitted the Parmesan and chives and gently fried the 12 peeled and chopped prawns in the butter. The ginger wine made it quite sweet and I balanced this by adding more lime juice. Put the oil in a large saucepan, add the onion and let cook for one minute over medium-high heat, or until the onion is soft. Add the rice and stir for 1 or 2 minutes until all the grains seem coated with the oil. At high heat, add the wine and let it evaporate, add then gradually the boiling stock (one cup at a time, add new stock when the preceeding cup has been absorbed). The whole cooking process should take 18 minutes. To be sure, taste the rice at the end, it shouldn’t be hard but definitely not too chewy either (al dente, that is). 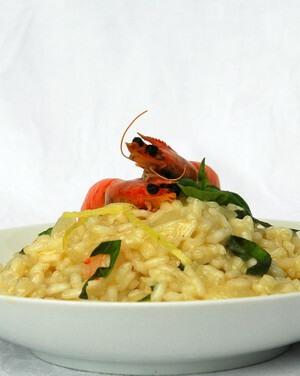 At this time take the risotto of the heat, and add 4 tablespoons lime juice, the grated rind, cooked chopped prawns with the butter they were cooked in, shredded basil, salt & pepper to taste, stir well and let it rest for a few minutes. Before starting to cook the risotto you should prepare the prawns: wash them first, cut of their heads and peel body, removing vein down the back of the prawn. Chop into bite size pieces. Melt butter in fry pan and gently sauté prawns until cooked. Decorate the risotto with unpeeled prawns and serve. P.S. Click on the photo to see their pretty eyes!